With interest in custom built homes continuing to rise in Sydney, there has never been a better time for new home builders operating in the prestige property market. From customer’s’ perspective, this represents an ideal climate in which to create your dream home. Whether you’ve been planning for a while or have only just started, there are plenty of things to consider about appointing or already working with custom home builders. Firstly, research and plan thoroughly. There are so many different styles when it comes to homes, and if you’re creating your own dream home it’s a good idea to see what’s already out there. It will help to give you ideas when it comes to your favourite design and you might find things that you haven’t thought of yet. For a home that is unique, you might take little pieces of inspiration from a few different houses you’ve seen and put them together depending on your style and requirements, or you could come up with something entirely new. It goes without saying that a reputable custom home builder in Sydney will be able to guide you, but it will certainly help if you’ve researched your options well. Custom home builders note that one of the most frequent pieces of advice they give to clients is to be aware of the site they are working with. When it comes to the design of your home you want it to suit, and fit, the land you’re building on. If you don’t need much outdoor space, then you can sacrifice that for a bigger interior, but if you need a big exterior area, this is something to keep in mind. Everyone has different needs when it comes to their home and determining your needs with guidance from an expert home builder like CPT Construction is essential. Depending on whether you’re building for a small or big family, or maybe even to create an investment property, that can have a significant influence on the overall design. A big family will require more bedrooms, bathrooms and probably a larger family room, whereas someone who works from home might want a big home office, or if there are pets, a spacious garden. When is comes to the budget, all custom home builders know that to build a luxury home cost money; that’s to be expected. Also, with land prices continue to grow in Sydney, one of the trends becoming popular is to build smaller homes. Unless you have a huge family, most clients, even in the luxury property market, agree that optimising space is preferable to purchasing large quantities of it. The rooms that you know you’ll spend the most time in you can make slightly bigger, but downsize any rooms that you can. A smaller house means lower costs, both in the building process and also when it comes to heating and cooling your home. Finally, a good custom home builder will be able to help you maximise the luxury features in your home. This can include issues such as creating spatial flow, but also comes down to the details. Custom home builders are using a range of materials and colours to add touches of modern luxury to their homes. If you choose stylish, classic touches that won’t date, these can keep your home looking amazing for years. Wooden floorboards always add polish. Moreover, copper and marble are two materials that are very popular at the moment, but will still look stylish for many years to come. 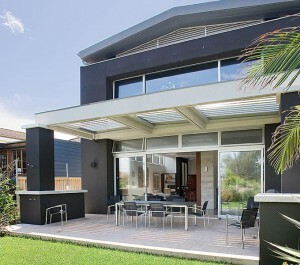 When it comes to working with a builder to create the ultimate in modern luxury homes, there are numerous considerations to be aware of, but if you plan and budget properly, there’s no reason why you can’t create the home you’ve always dreamed about. If you would like to discuss your plans of building a custom home, book an appointment with one of our experts from CPT Construction.